During the spring and autumn season pleasure cruises are possible every day on Lake Geneva boats. Genève, Lausanne, Nyon, Vevey and Montreux are good departing ports for Lac Léman cruise excursions. Pleasure cruise boat excursions on Lake Geneva’s CGN boats offer one of the best ways to explore the beauty of the Lac Léman region in western Switzerland. In spring and autumn sightseeing pleasure cruises are available every day in addition to the regular passenger ferry boats crossing the lake to connect Swiss and French cities. Geneva, Nyon, Lausanne, and Vevey are good cities to depart on boat cruises with many boats also passing the Lavaux area and calling at Montreux and Chillon. Lunch and dinner cruises are popular and may require advance reservations. 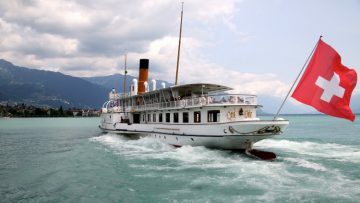 Historic paddle steamers are used on some routes, especially in the upper lake are between Lausanne and Montreux. Except for special dinner cruises, passengers can choose any of the ports of call to start and end pleasure cruises. The CGN timetable for spring and autumn is usually operational from mid-April to mid-June and from mid-September to mid-October. The winter timetable is much more limited with pleasure cruises generally available only on weekends. The summer timetable is much busier with many daily departures even from smaller ports. 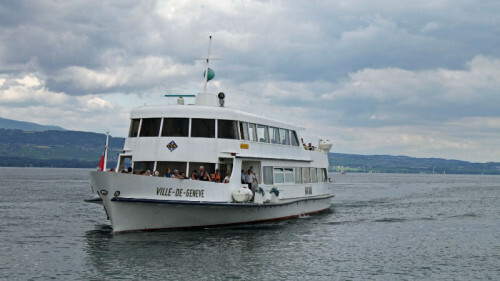 Geneva is a good departure point for pleasure cruises on Lake Geneva. In spring and autumn, cruises departing from Genève include circular city tours, excursion sightseeing cruises, as well as lunch and dinner cruises. 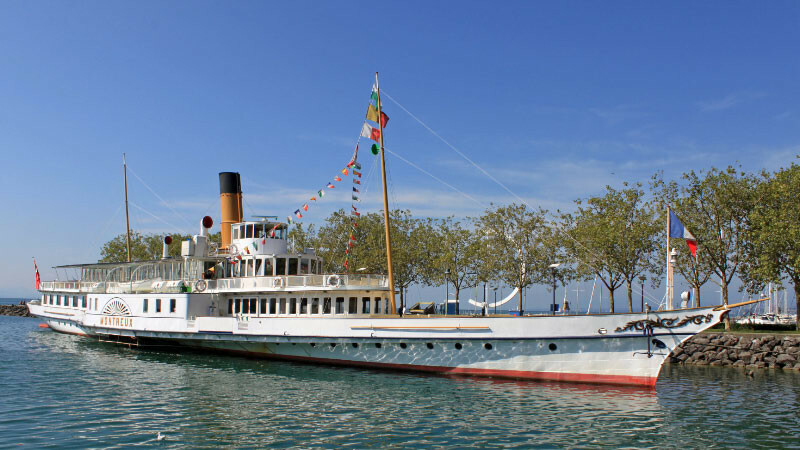 Geneva Tour – an hour-long circular cruise from Geneva with commentary of the sights on the shores of the lake. Up to six cruises are available per day. Smaller boats without restaurant services are usually used for these cruises. Beautiful Panoramic Cruise (Majestueux panorama du Léman) – this is the longest cruise available on Lake Geneva during the shoulder season. On weekends, it goes all the way from Geneva to Lausanne (and back) with stops en route at Versoix, Coppet, Nyon, as well as Yvoire and Thonon in France. The cruise time is just over three hours in each direction. On weekdays, two cruises are available but only up to Yvoire (two hours) and Nyon. Lunch and sunset dinner cruises are available most days from Geneva. Reservations are optional but recommended, especially over weekends. Fondue cruises are usually available on Friday evenings – reservations are required. CGN boats depart from two different landings in Geneva – Genève-Mt Blanc (MB – near the train station) and Genève-Jardin Anglais (JA – near the old town). Not all boats stop at both jetties, while some also call at Genève-Eaux-Vives and Genève-Paquis. Lausanne-Ouchy is a busy port for CGN lake boats. 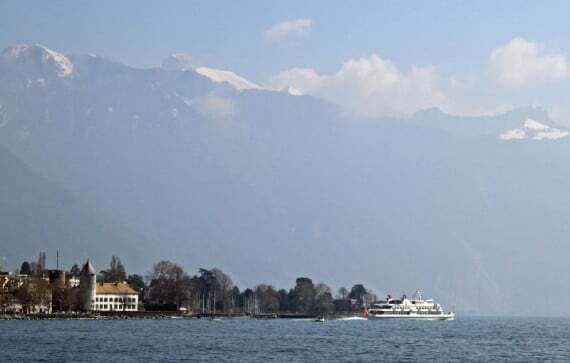 Passenger ferries from Lausanne to Evian and Thonon-les-Bains in France operate year round but pleasure cruises and dinner cruises are also available from Lausanne. In autumn, cruising past the UNESCO Cultural Heritage-listed Lavaux vineyards is particularly spectacular on sunny afternoons – it is arguably the best and most beautiful cruise route on Lake Geneva. 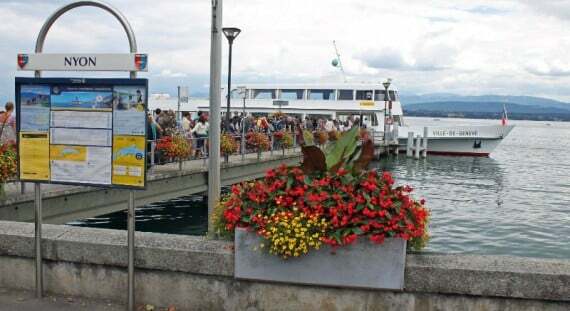 Passenger ferries from Lausanne to Evian (Route N1) and Lausanne to Thonon-les-Bains (Route N2) in France. Up to 13 ferry rides per day are available on each route in each direction. Despite the longer distance, the Lausanne to Thonon route is often faster and significantly more expensive than the popular tourist Lausanne to Evian route. The crossings take around 30 minutes. Buy tickets before boarding these ferry boats or risk heavy fines! Ferry services are more limited on Sundays. Cruising past the World Cultural Heritage Lavaux vineyards – a spectacularly beautiful cruise from Lausanne-Ouchy to Chillon Castle stopping en route usually at Pully, Lutry, Cully, Rivaz, Vevey-Marché, Vevey-La Tour, Clarens, Montreux, and Territet. During the shoulder seasons, this Lake Geneva cruise is available twice per day in each direction. It passes the beautiful Lavaux vineyards between Lausanne and Vevey with spectacular Alpine scenery on the south of Lac Léman. The cruise is around 90 minutes in each direction. On weekend afternoons, it is possible to cruise from Lausanne all the way to Geneva – see Beautiful Panoramic Cruise above. On weekends, it is possible to cruise from Lausanne-Ouchy to Yvoire (France) with stops en route at St Sulpice VD, Morges, St Prex, Rolle, and Nyon. This cruise is around two hours each way. The most spectacular scenery along the shores of Lake Geneva is at the far eastern end of the lake near Montreux where the Rhone flows into Lac Léman. In this area, Alpine peaks tower over the water to form a spectacular backdrop not available to pleasure cruises closer to Genève. The Wonderful Alpine Scenery (Splendeur des Alpes) cruise follows a circular route through the region. Up to five cruises sail per day – but not all boats go the full circle and stop at all landings. A full Le Bouveret circle takes around two hours while Vevey-Marché to Chateau de Chillon is 50 minutes. Ports of call include Le Bouveret, St Gingolph, Vevey-Marché, Vevey-La Tour, Clarens, Montreux, Territet, Château de Chillon, and Villeneuve. 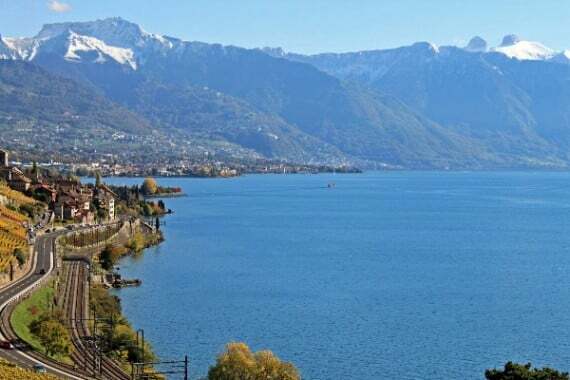 Book Montreux Tours at GetYourGuide. Nyon in the La Côte area is also a good departure port for Lake Geneva cruises. Nyon has excellent transportation links to Genève and Lausanne allowing travelers to use trains to cover part of the journey from either of these Lac Léman cities. Cruise options from Nyon include the regular passenger ferry services, which operates year round to Yvoire (up to 10 sailings on spring weekends) and Chens-sur-Leman. In spring and autumn, daily cruises from Nyon go to Geneva with a connection available to Lausanne over weekends. See also Savings Tickets for CGN Lake Geneva Boat Cruises for details on how to save on excursion fares when sailing on Lac Léman.